Contrary to many reports on exports, the review below shows that exports are doing very well. 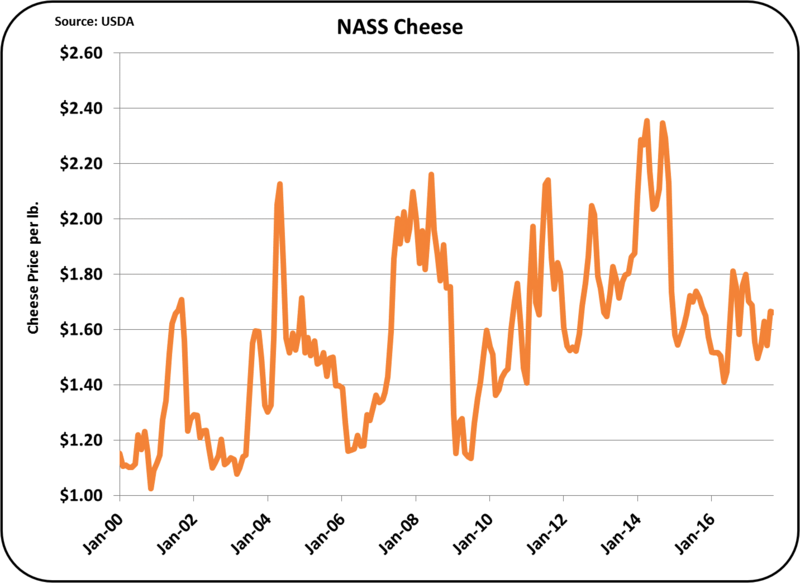 While Nonfat Dry Milk (NDM) is the largest export item, when it comes to setting producer milk prices, the commodity to watch is cheese. See the March 12 post to this blog if you have any doubt about this. 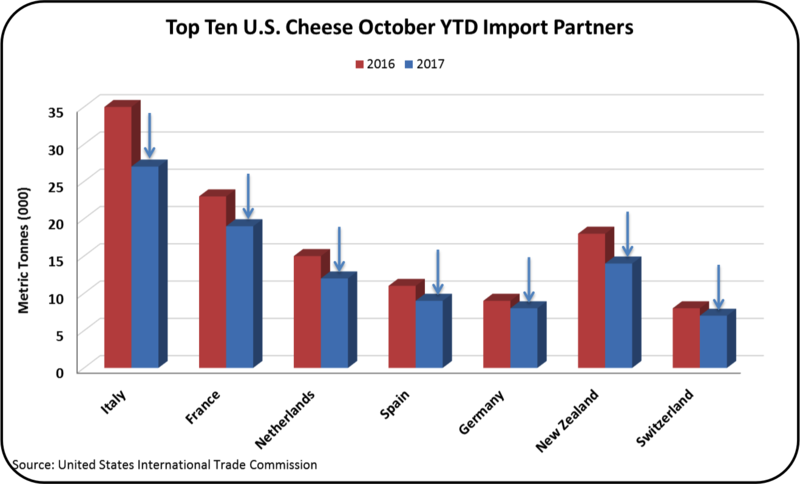 Cheese exports were near a record level for the month of October. They were above 2014,2015, 2016, and near the same volume as 2013. That is excellent growth in a competitive global market. 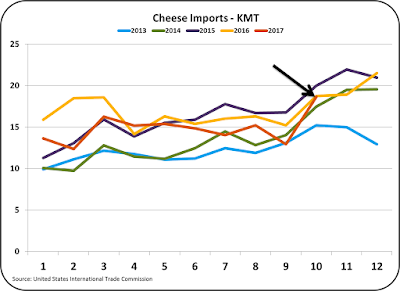 Imports of cheese (Chart II) were unfortunately up significantly in October, however, they were still at or below the prior two years. The heavy imports kept net exports from reaching record levels, but net exports were still above the prior two years and close to 2014. Cheese exports by country show amazingly strong growth in 2017. Exports to the top ten buying countries were all up with one very small exception, Canada. Cheese imports by country also show YTD improvement. 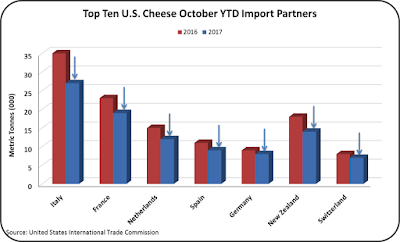 For each of the seven countries supplying cheese to the U.S., that volume was down. This helps take pressure off high inventories. 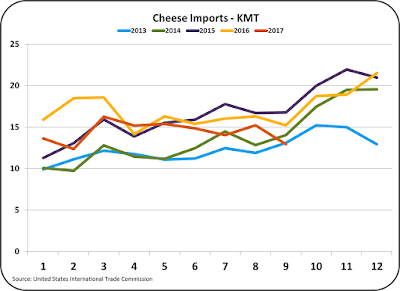 Of course there is always room to further improve, but the statistics on exports and imports of cheese look very strong. 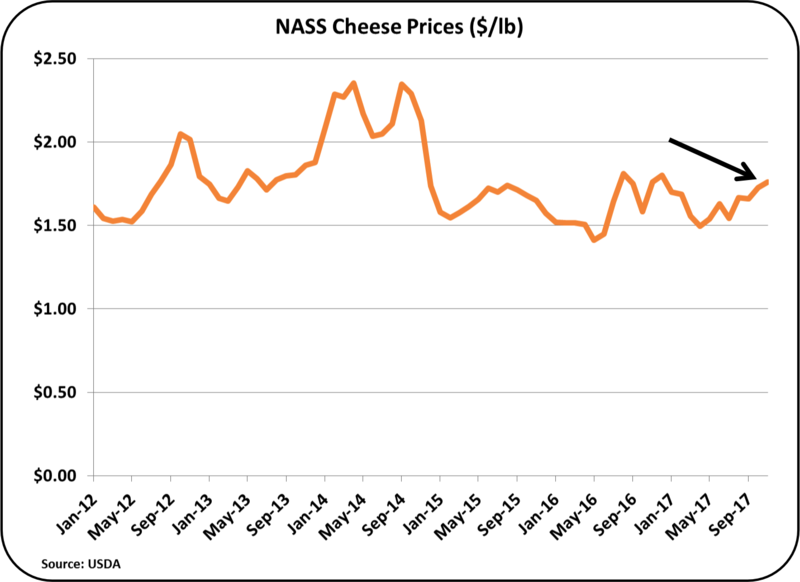 With a continuance of this effort, 2018 could see lower cheese inventories, higher cheese prices, and higher Class III milk prices. With about 95% of U.S. cheese consumed in the U.S., the price is primarily controlled by domestic events. Cheese futures prices on the CME are down from current levels. 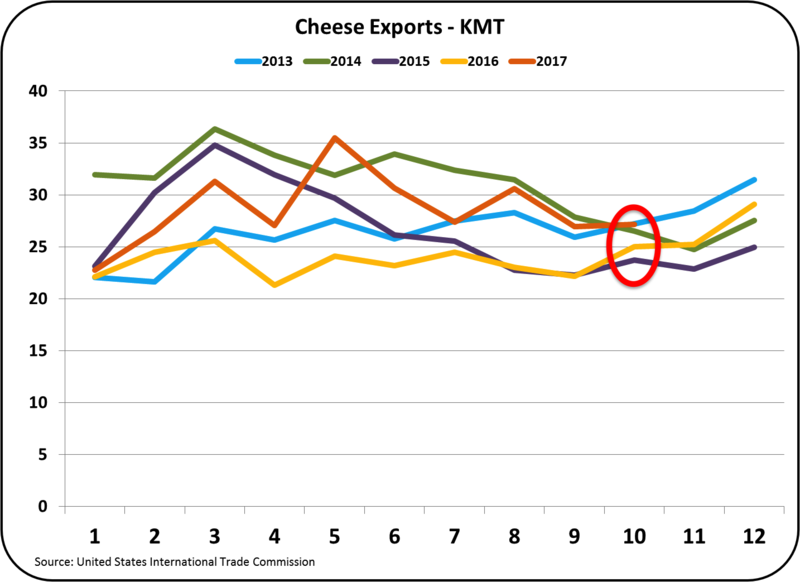 The continuing recovery is very dependent on more positive results for cheese exports. 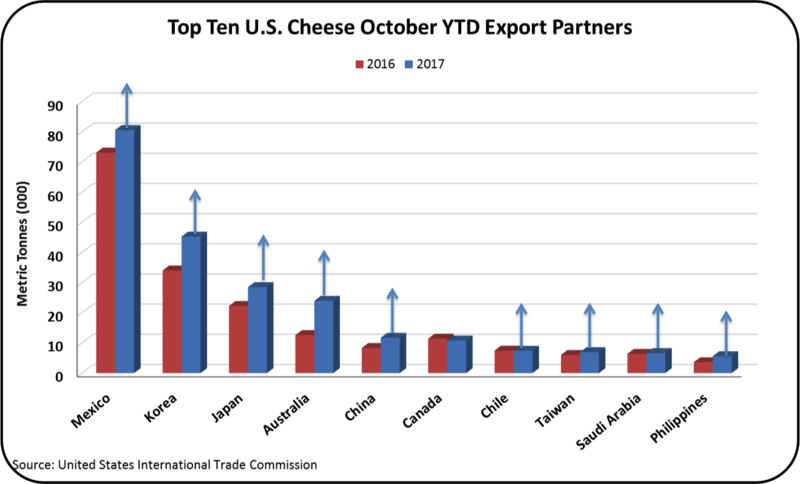 China is a growing market and there are new agreements with China on imports of dairy products, While the future is always cloudy, there is a reasonable expectation of continuing improvements in cheese exports. 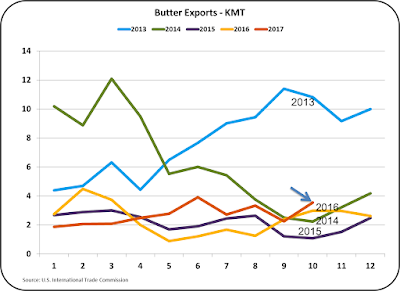 Exports of butter continue at the levels of the prior three years. October exports were up, but still on a very small base. 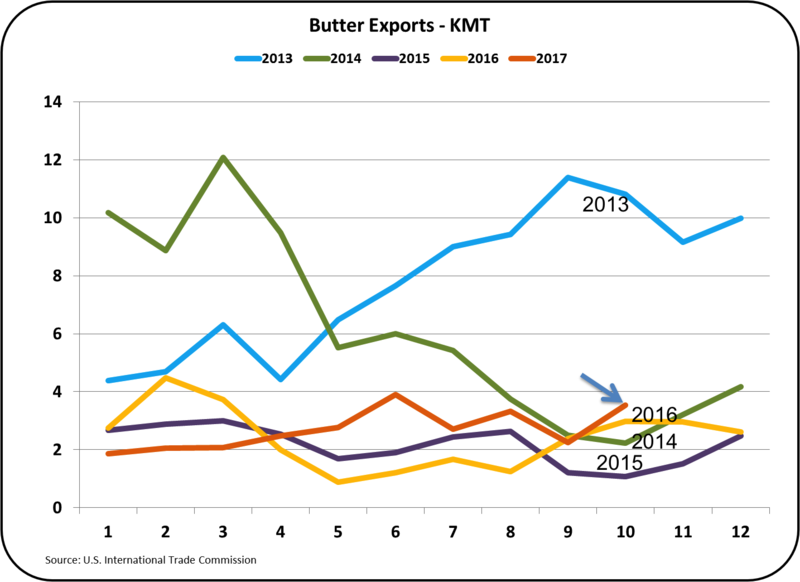 In the last five years, there has only been one period of significantly higher butter exports and that was in late 2013 and early 2014. 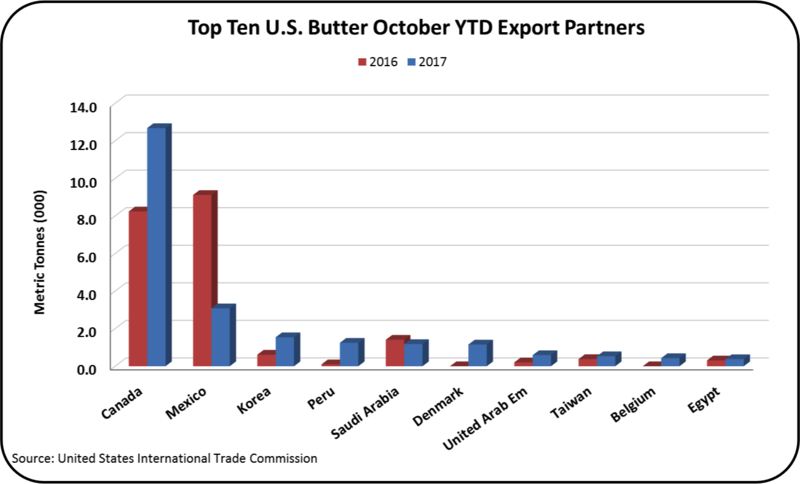 Butter exports are small, and they are concentrated in exports to one country, Canada. The current NAFTA discussions between the U.S. and Canada do not seem to be going anywhere. If NAFTA does not stay in place, Chart VI below could change drastically. Much of the current news on NDM has centered on slowing exports, growing domestic inventories and lower NDM exports. While all this is true, the analytics do not show extreme weakness. 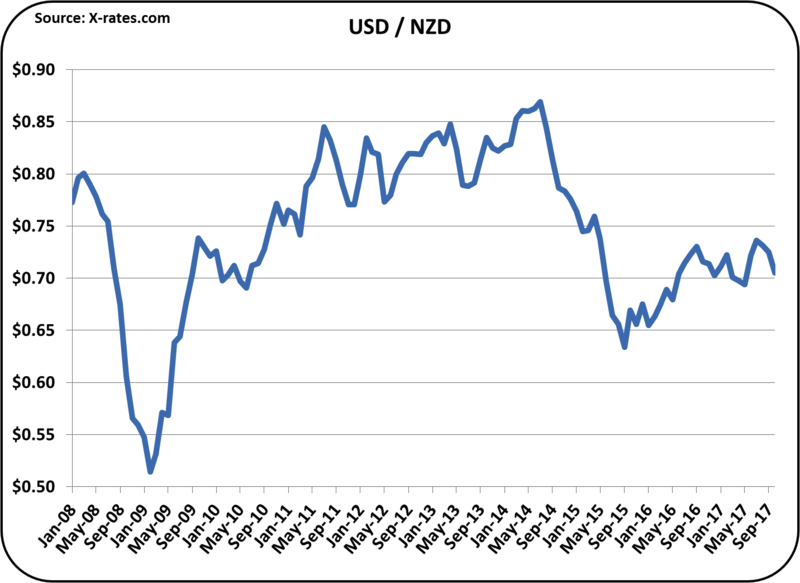 Certainly global prices of NDM are low and inventory is plentiful. However, as seen below in Chart VIII, October exports were at or above prior years except for 2016 when NDM exports peaked. The October 2016 peak was driven by specific events and was only temporary. Yes, inventories are high, but the highs are driven by over production as shown in Chart IX below. Production data is currently available only through September. In the months of August and September, when export levels did not grow, production did grow. The result is obvious, bloated inventories. Overall, dairy exports are not in bad shape. There are no planned posts to this blog for the remainder of 2017. Happy Holidays to all and new posts will start in early 2018. Class and Component prices for November, 2017 were announced on November 29. While the dashboard below shows a lot of red, November was actually a positive month. Cheese prices were up and cheese is the primary determinant of the Class III milk price, which was also up. The Class III milk price was $16.88/cwt. 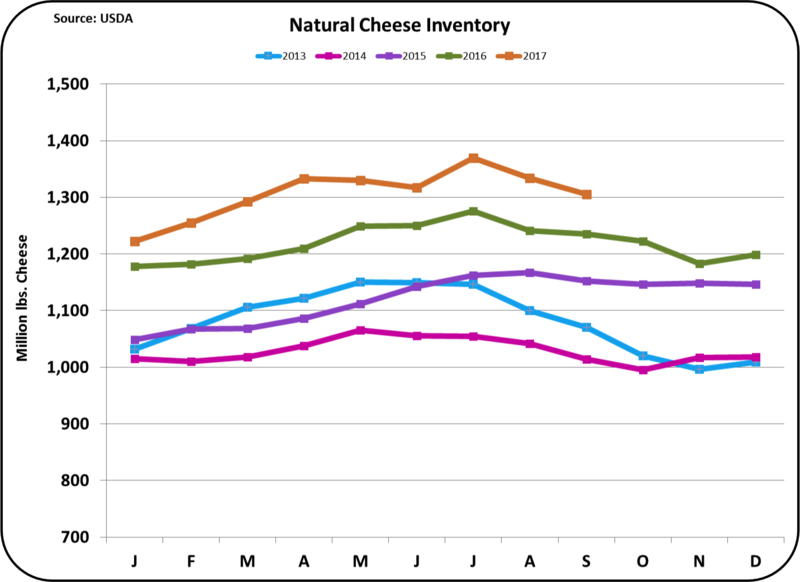 Cheese inventories were down for the third straight month and lower cheese inventories will continue to bring milk price improvements. 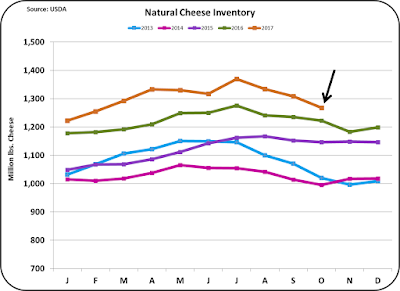 Chart II below shows the drop in cheese inventories. They are still high, but they have come down nearly 100 million pounds in the last three months. The decrease in inventories is a combination of both increased exports and reduced cheese production (Chart III). Exports will be covered in detail in the next post to this blog. As a result, cheese prices were up for the fourth straight month (Chart IV). The current price is $1.76/lb. That is above all of 2015 prices, above 11 out of 12 months of the 2016 prices, and is also the best monthly price for all of 2017 YTD. These are clearly very positive signs. The November Class III milk price is the highest monthly price for 2017 YTD, and is higher than 10 out of 12 months of 2016. Chart V shows this graphically. This is also a very positive sign. Butter inventory is down (Chart VI), but this is part of an annual cycle. 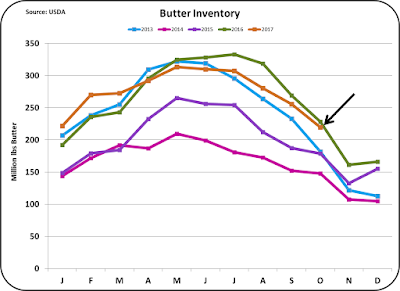 For this time of the year, butter inventories are actually rising. As a result, the butter price is falling. This is the third consecutive month of falling butter prices (Chart VII). As cheese prices rise and butter prices fall, the pie chart below shifts to a higher financial contribution from milk protein and a lower contribution from butterfat. Milk protein is now up to $2.34/lb., up from $1.22/lb. 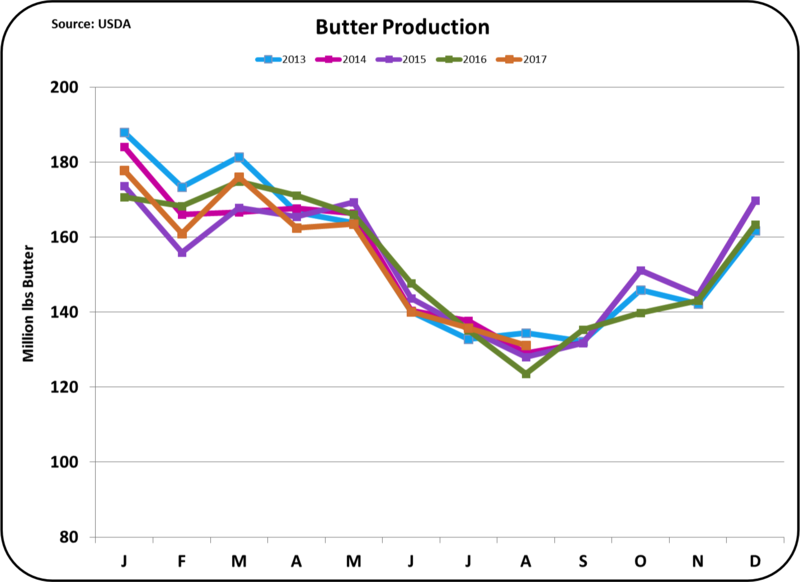 in July and butterfat is down to $2.55/lb. down from $3.01/lb. in August. Where is the market going? 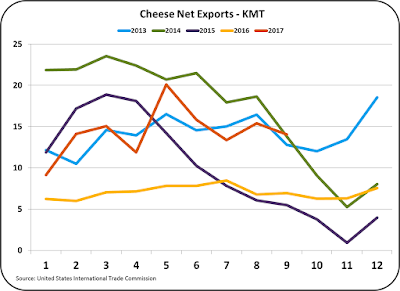 Will cheese exports continue to grow and shrink inventories? 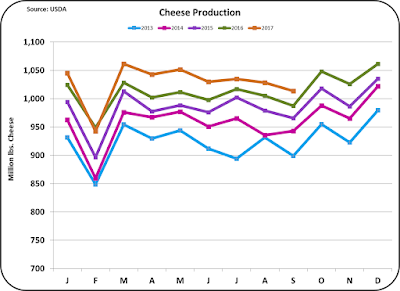 Will cheese production escalate and increase inventories? Will butter consumption decrease with high butter prices or will butter demand escalate and put pressure on butter prices? While there are lots of very smart people attempting to make educated guesses on these movements, the fact is that no one can accurately predict which way the markets are going. There are just to many variables influenced by multiple global factors. In the October 29 post to this blog, the practice of adjusting cow nutrition needs to out-guess where the market was going was addressed. Quoting from that post, "Chasing the market prices with constantly changing nutritional diets is not a best practice." Staying with and fine tuning nutritional needs for component production is a much better practice. There was some bad news in the November statistics. 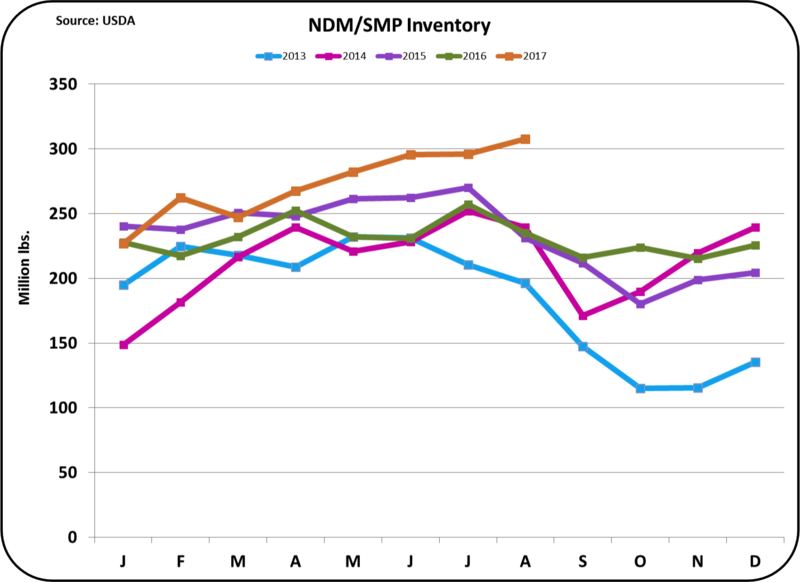 Nonfat Dry Milk (NDM)/Skimmed Milk Powder (SMP) inventories are out-of-control. (See the December 18, 2016 post to this blog for a review of the difference between NDM and SMP.) Over production and strong international competition have bloated inventories to extreme levels. 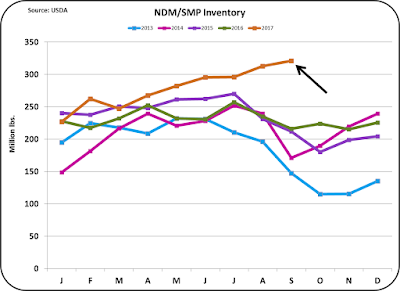 With high NDM/SMP inventories, price will plunge. The price of NDM/SMP is at a low for this year. 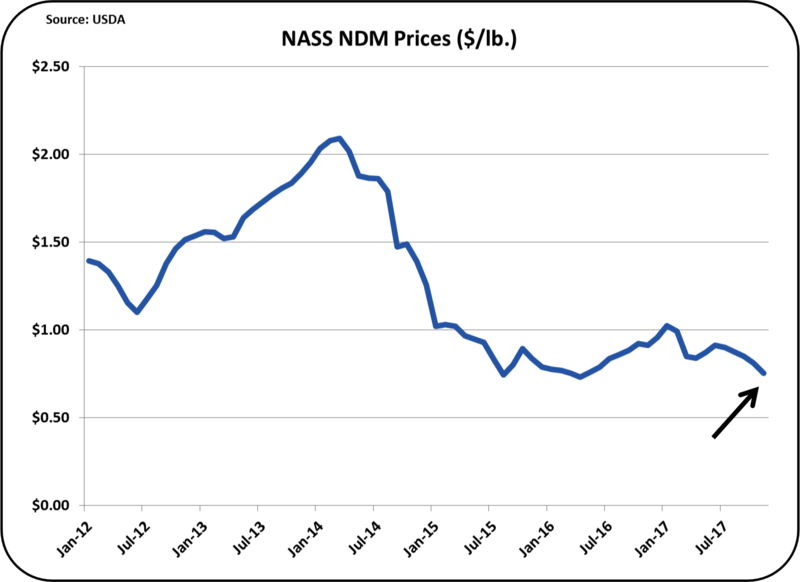 NDM/SMP was prices for November were $.75/lb., down 25% from the beginning of 2017. 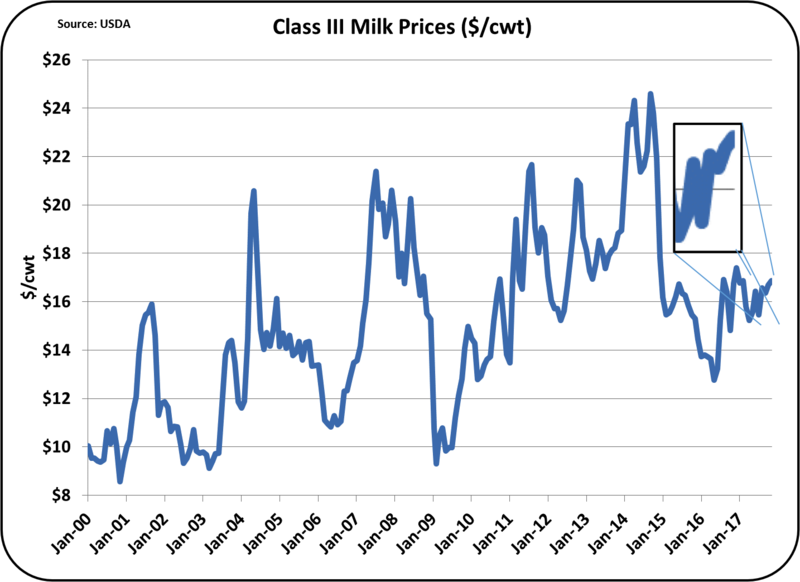 That has pushed the value of skim Class IV milk to $5.23/cwt., down 31%. 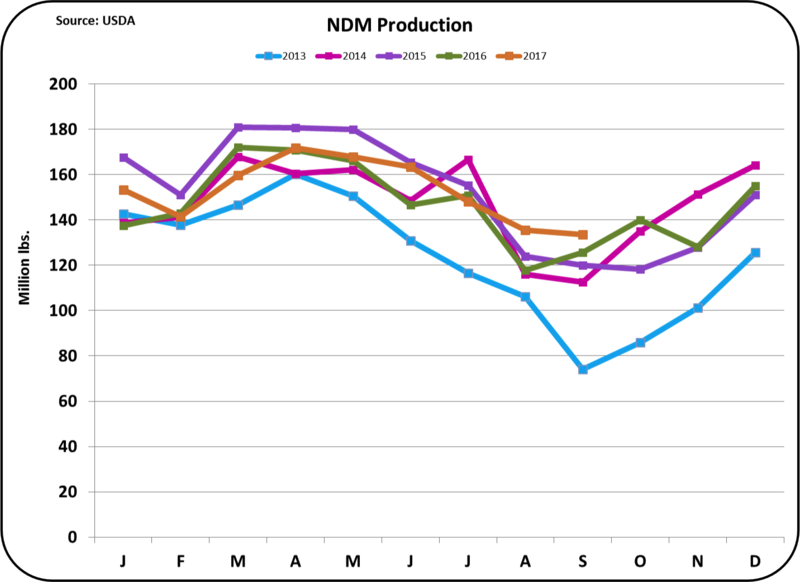 With the exception of NDM/SMP, November was a "Very Good Month." The Proposed Change in the Class I Price Formula-Is it Good for Producers? The proposed change in the Class I formula for computing the price was reviewed in this blog on October 1. Now that advanced pricing data for the full year of 2017 is available, a more complete analytical analysis is possible. Because the Class I category is the second largest of the four Classes of Milk, any change will be impactful. This post will review the impact of the change from the point of view of a producer. 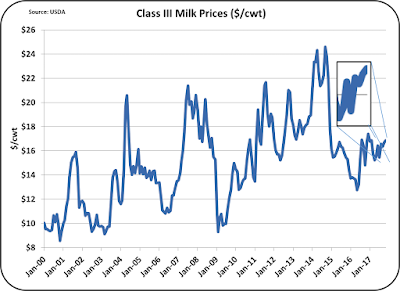 The current formula for determining the base Class I advanced price is the "Higher of Advanced Class III or IV Skim Milk Pricing Factors." The proposed formula is the "Average of the Class III and Class IV Skim Milk Pricing Factors plus $.74." The purpose is to allow improved hedging to exactly match the formula pricing. Because the Class III and Class IV factors can be hedged on the CME, the two can be hedged exactly. When the formula says that the price is the "higher of", hedging can be may not be accurate because the hedging had to bet on one or the other of the Class III or Class IV price. For those who hedge (primarily processors) this formula change will improve their predictability via hedging. Average Class I base skim prices were calculated for both formulas, the current and the proposed. Additional, the volatility of the Class I base skim price was calculated for current and proposed formulas based on traditional methods of measuring volatility. Volatility is typically measured by comparing the standard deviation of the data for each case. The change is then expressed as an index. 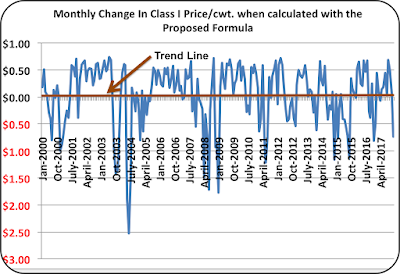 Other parameters were measured as well, such as frequency of use of Class III or Class IV in the current formulas, and trends in the frequency, impact of the proposed formula change on monthly pricing. Table I compares the Class I base price averages for the time periods listed above. In each comparison, the average price is higher by the proposed formula than by the current formula. The changes for just 2017 were up by $.11/cwt., but for any longer period, the change was insignificant. From a producer's point of view, based on Table I, there is no reason to resist the change to the proposed formula. 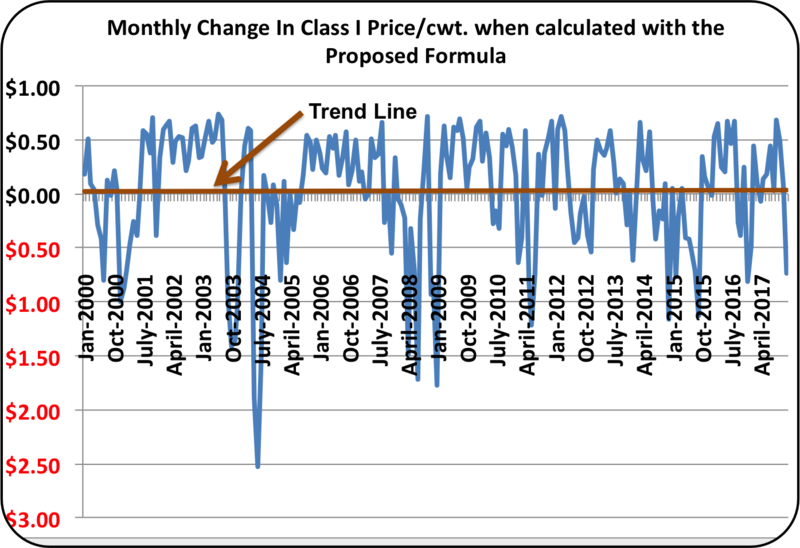 Table II compares the impact of volatility in Class I prices when calculated by the current and proposed formulas. In each case, the volatility is less with the proposed formulas than with the current formulas. From a producer's point of view, based on Table II, there is no reason to resist the change to the proposed formula. Table III compares the number of months that the proposed formula was higher or lower than the current formula. Over the last 18 years (216 months), in 137 months, the price was higher, and in 79 months, the price was lower over the last 18 years. Similarly, over the last ten years, the last five years, and 2017, the number of positive months outweighs the number of lower priced months. From a producer's point of view, based on Table III, there is no reason to resist the change to the proposed formula. 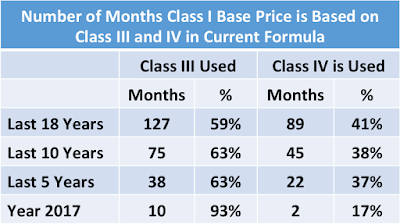 Table IV shows the months and percents of using Class III and Class IV prices over the trial years. The mix seems consistent except when viewed for a single year. If the demand for butter creates too much skimmed milk, the skimmed milk may only find a home as nonfat dry milk in the international markets. The excess could keep Class IV prices low. In that case, the inclusion of a low Class IV price in the Class I formula could make Class I price lower. More on this below. Table V shows the largest variations, both positive and negative that would occur via the change in formula. If calculated by the new proposed formula, the largest monthly increase compared to the current formula was $.72/cwt. However, the largest monthly decrease compared to the current formula was $2.53/cwt. Because the change in the average price does not significantly change and because there are more positive months than negative months, it does make sense that the negative months have to change by more than the positive months change. 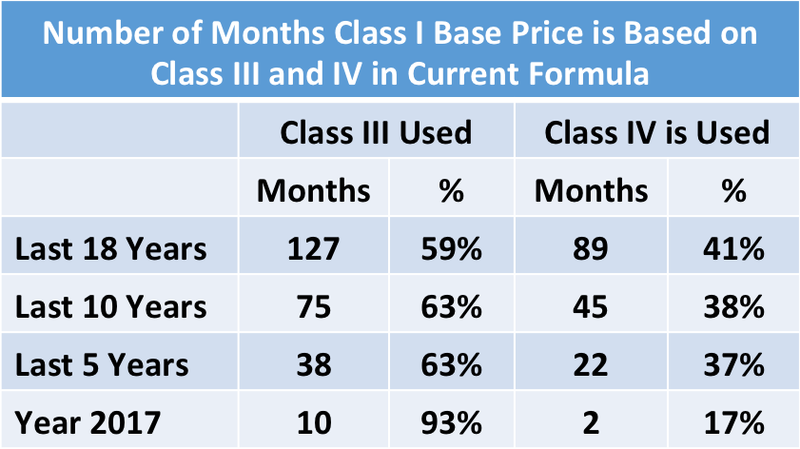 To further explore the impact of the new pricing formula, Chart II shows the monthly change in Class I base skim price if the proposed formula was used over the last 18 years. As shown in Table V and Chart II, the increases in price topped out at $.72/cwt. and the decreases in price have lows dipping to $2.53/cwt. The pattern of larger price changes for negative months is consistent for all date ranges in Table V. Importantly, note that the trend line of the change remains extremely flat, indicating that the $.74/cwt. addition to the formula in the proposed formula is reasonable and should remain reasonable in the future. From a producer's point of view, based on Table V and Chart II, there could be a reason to resist the change to the proposed formula. If cash flow was so tight, that a significantly lower Class I price would in a single month become a disaster, than the change in the Class I formula would create the possibility of that disaster. In most cases, producers would be able to weather a month or more of a lower price if it all evens out over the long term. In summary, there appears to be very little reason for a producer to resist the proposed change in the Class I formula. However, to does nothing to benefit producers who do not hedge and very few producers to hedge. A few items, such as long-term depressed prices for Class IV milk could make the proposed formula less attractive. However, history does not currently show any long-term trend of low Class IV prices. September export/import data for dairy products is now available. Overall, September data did not create a "blockbuster" month. However, it was an "OK" month in many respects. 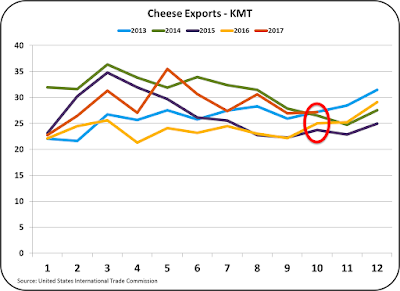 For instance, cheese exports are statistically down from the prior month, but they are also at a near record level for the month of September and just shy of the 2014 record for cheese exports. Cheese imports were down from the prior month, which helped reduce cheese inventories (see prior month post on cheese inventory levels). 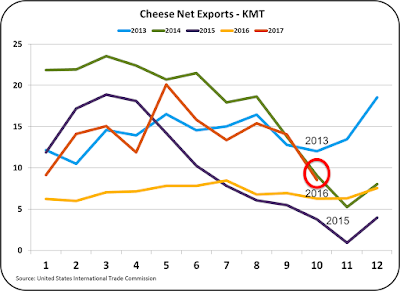 Because cheese exports are at near record levels and because cheese imports are down, cheese net exports are actually at a new record high for the month of September. It was a only a slightly higher record, but a record is a record. 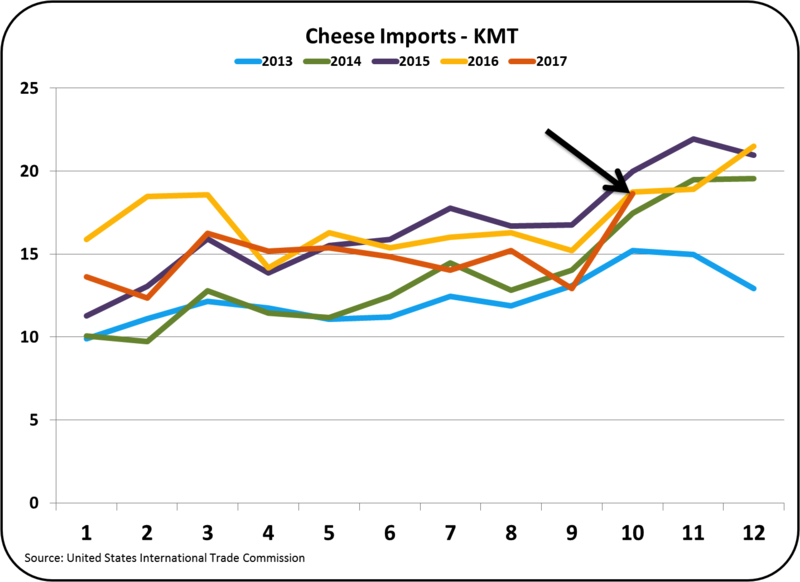 Cheese export volumes YTD show an improvement over 2016. Cheese exports to the top four importers, Mexico, South Korea, Japan, and Australia are all nicely up vs. the same period of 2016. There has been encouraging news on additional cheese sales to both South Korea and Japan. Perhaps the efforts of President Trump on his current Asian trip will help further develop trade with South Korea and Japan. Because export volumes by month can be erratic, Chart IV is perhaps the best example of progress in cheese exports. 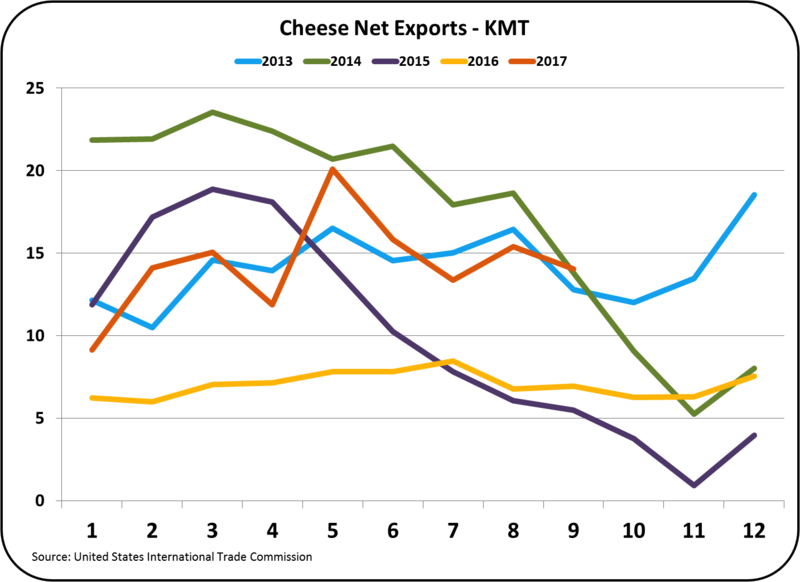 With improved cheese exports, cheese inventories will fall, and cheese prices will improve. Due to the close linkage between cheese prices and the Class III milk price, Class III milk prices will also improve. U.S. exports of cheese seem to be headed the right direction. 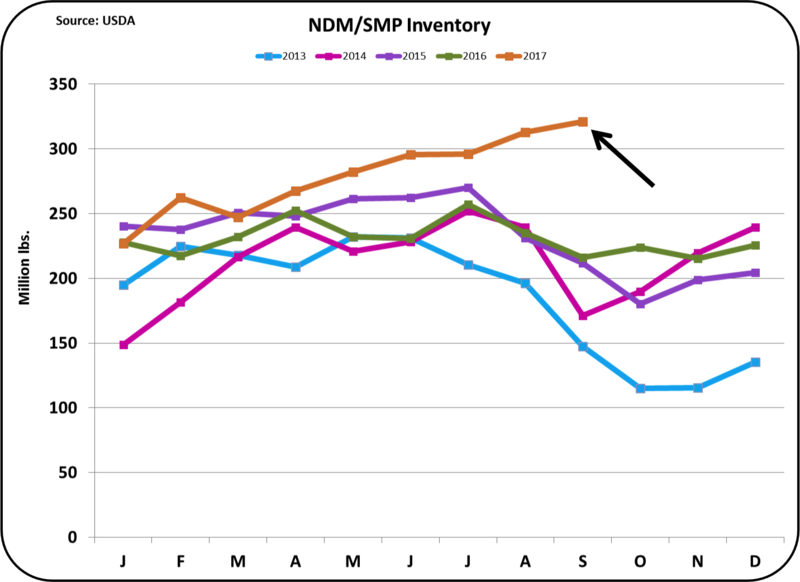 As mentioned in the prior post to this blog, Nonfat Dry Milk/Skimmed Milk Powder (NDM/SMP) inventories are bloated. More NDM/SMP is being produced than can be used domestically or exported. 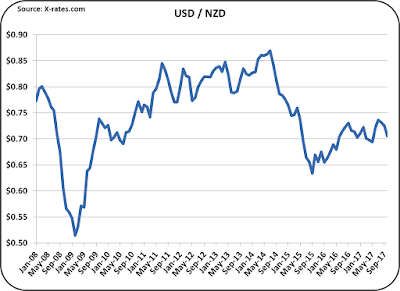 The decreased level of exports has continued for the last four months and is troubling. 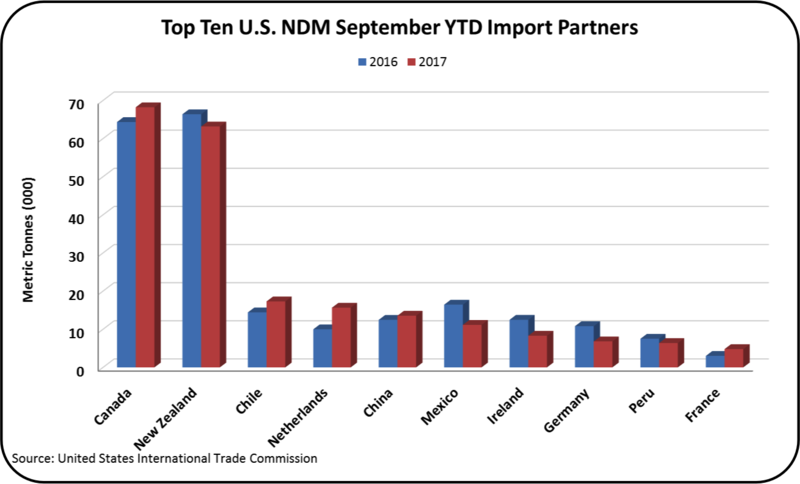 September NDM/SMP exports were at a low for 2017 and lower than the last six month of 2016. The international markets are crowded with offers to sell NDM/SMP and prices are low. As shown in Chart VI, there are significant imports of NDM from Canada and New Zealand. 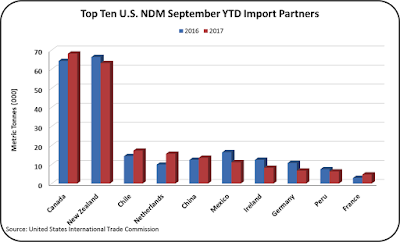 These imports are adding to the bloated NDM inventories. They were no doubt purchased at "bargain" prices. While we are importing NDM from Canada, we are also exporting butter. 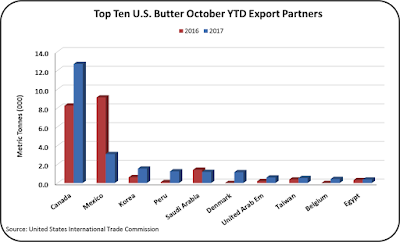 While very little butter is exported from the U.S. most all of that butter is exported to Canada (Chart VII). Canada has a critical balance between too little butter and too much skimmed milk. 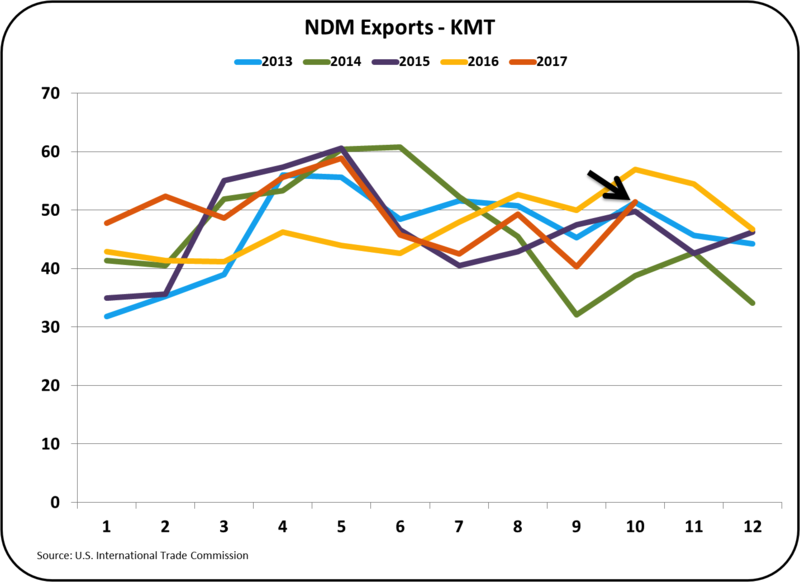 Because of the high costs of dairy production in Canada, it is difficult to export NDM in a very competitive international market. 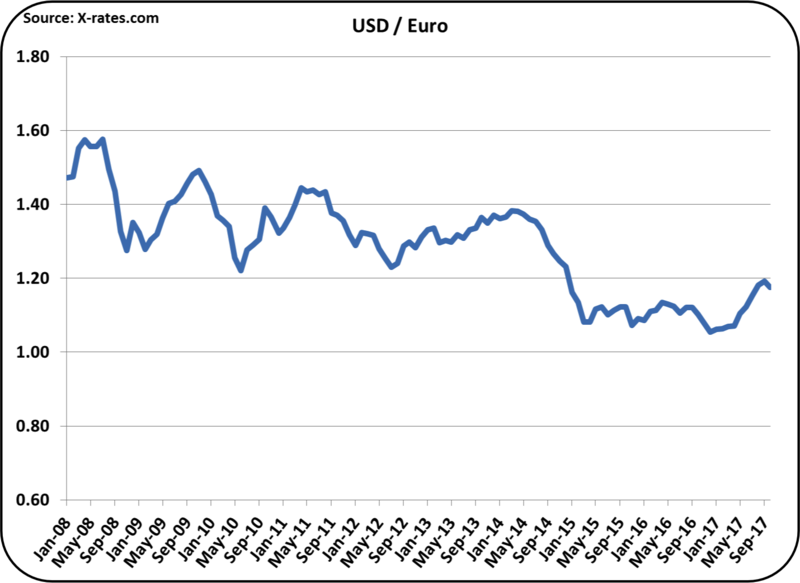 So far this year, the USD has weakened against other currencies, helping to make exports more competitive. 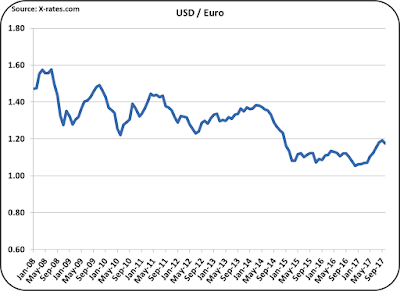 However, in the last 30 days there has been a strengthening of the USD. Hopefully this is a short-term event. The U.S. began a strong effort to enter the global market for dairy products more than a decade ago. The effort has been successful and the U.S. is a very strong player along with the E.U. and New Zealand. The U.S. dairy market's transition to a global environment was inevitable, just as the transition from local domestic markets to a national U.S. market was inevitable. These transitions both developed a more volatile and competitive U.S. dairy industry. The increased volatility is both a challenge and an opportunity for both producers and processors. An Interesting Month - A Return to Normalcy? October Class and Component prices were announced on November 1. It was a good month for producers with a 2% increase in the Class III price. Why was the Class III price up? 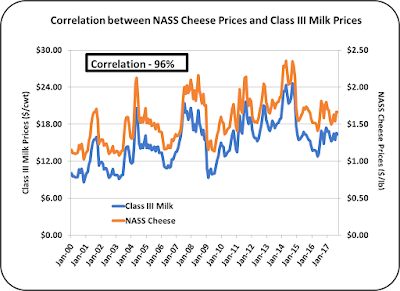 The price of cheese was up and there is a tight correlation to the Class III price. The analytics do indicate a return to more normal pricing. Milk protein took a huge jump up 24.3%. The milk protein price increase was the result of the two factors, cheese was up and butter was down (For more on the relationship see the October 22 post to this blog). This has brought the pie chart of component values making up the Class III price to a more "normal" relationship (Chart II). Milk protein's share of the Class III price increased from 31% in the prior month to 38% in October. 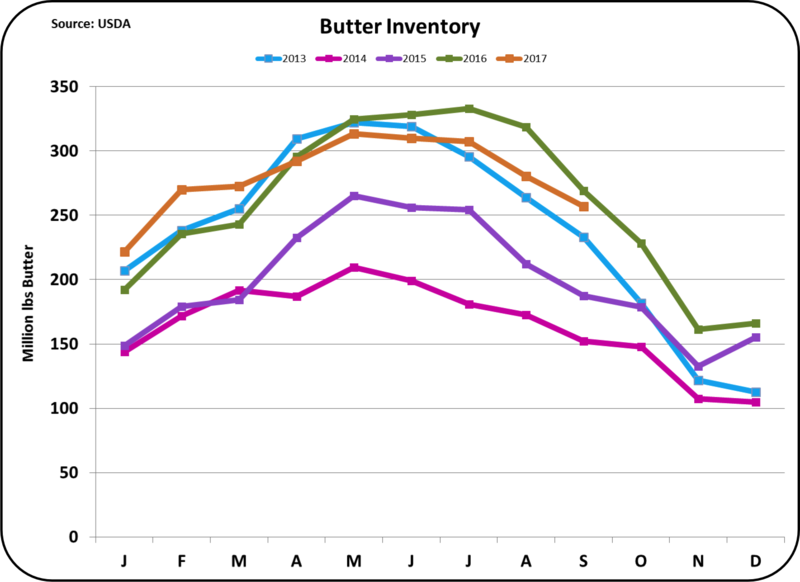 Butterfat fell from 61% of the value in the prior month to 56% in October. Cheese and butter prices are shown in Chart III below. While the butter price remains well above the price of cheese, there appears to be a move of falling butter prices and rising cheese prices. Chart III analytics plot the cheese and butter values over the last 18 years. Traditionally cheese and butter prices were pretty closely aligned. However, in the last three years butter prices have far exceeded cheese prices. 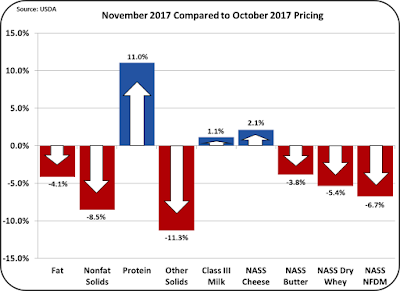 The lower cheese price has kept the Class III price down and the high butter price has made butterfat more valuable than milk protein. If the trend of lower butter prices and higher cheese prices continue, there will be a higher Class III price with a split of component contributions (Chart II), favoring more value for milk protein and less value for butterfat. Will the value move from butterfat to milk protein continue? Of course, this is impossible to predict, which is the reason to concentrate on increased components, both milk protein and butterfat, and not to try to change nutritional feed formulations back and forth emphasizing one component or the other. See more on this in the prior post. Again referencing the prior post, a producer practice of chasing the changes in milk protein and butter values by changing the nutritional parameters of feed is not a good practice. The goal should be to increase the level of both milk protein and butterfat in milk components. 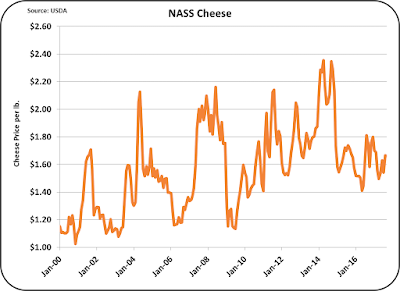 Why are cheese prices rebounding? Domestic inventories of cheese are falling as shown in Chart IV below. Changes in domestic consumption always follow a consistent and predictable increase and do not cause inventory fluctuations. The fluctuations in cheese inventories result from changes in exports and cheese production. Excess milk production going to cheese has contributed to the 2017 high cheese inventories. As shown in Chart V below, cheese production is currently following a pattern of higher production compared to prior years, but at a much lower level than prior months. The level of production for July and August match the long-term increases in domestic cheese consumption. 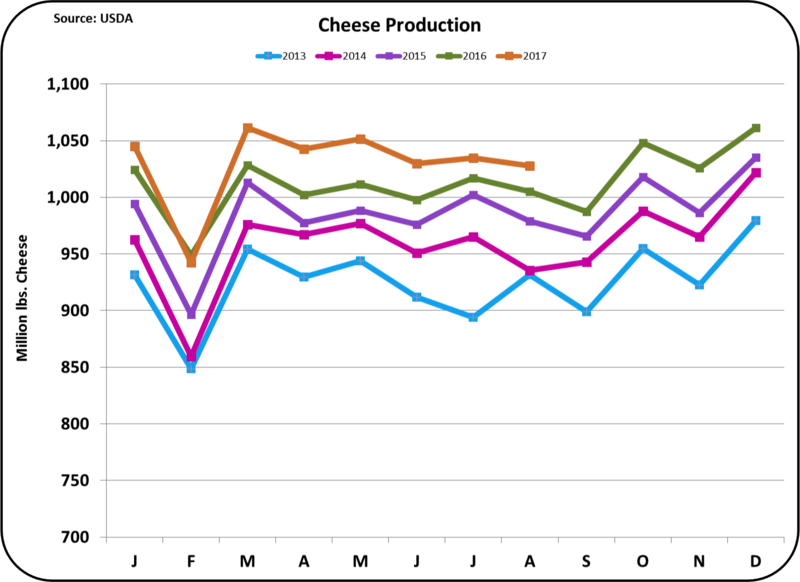 In March through June of 2017, the increases in cheese production were well above the levels needed to satisfy domestic consumption. Therefore, with weak cheese exports, inventories grew. Export of cheese for September will be covered in more detail in the next post to this blog, but the data is indicating a significant increase in September cheese exports. 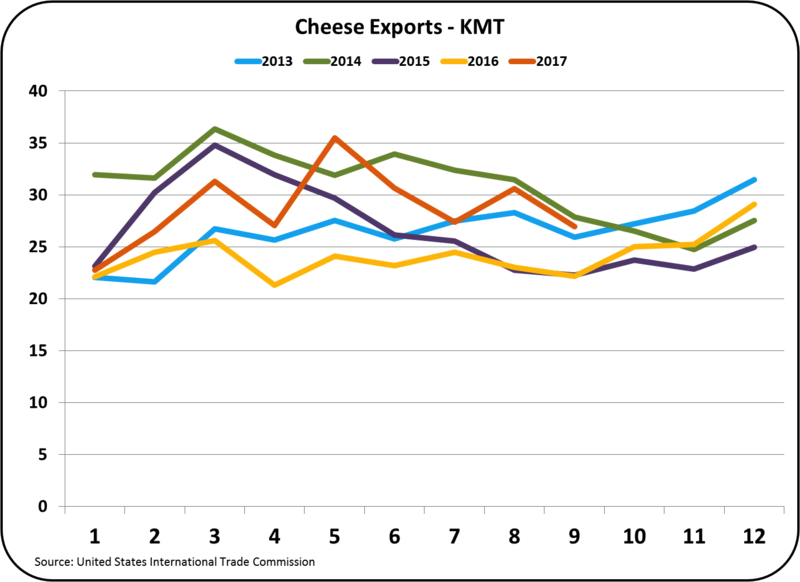 The combination of lower cheese production and increased cheese exports are both contributing to the lower domestic cheese inventory. 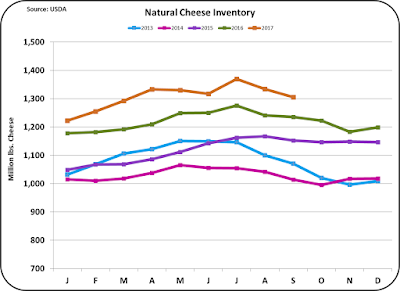 If these trends continue, inventories will continue to decline and the cheese price will increase. That will also increase the Class III price. Butter prices fell 6.2%. Inventories (Chart VI) are following seasonal patterns. 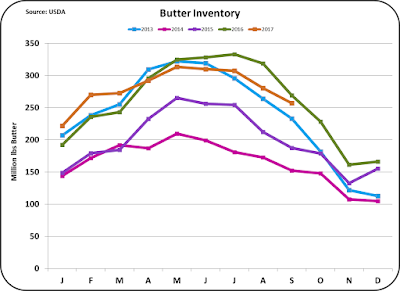 However, the butter inventory is at a slightly higher level in September compared to prior years. As the inventories go up, prices will fall. During April, May, and June of this year, inventories were below the levels of both 2015 and 2016. In July, August, and September the inventories were well above 2015 and just slightly under 2016 levels. As a result, the price of butter is falling. There is no current reliable data on domestic consumption, but new data will probably show a dip in domestic consumption with the high retail butter prices. Lower domestic consumption will lower inventories. 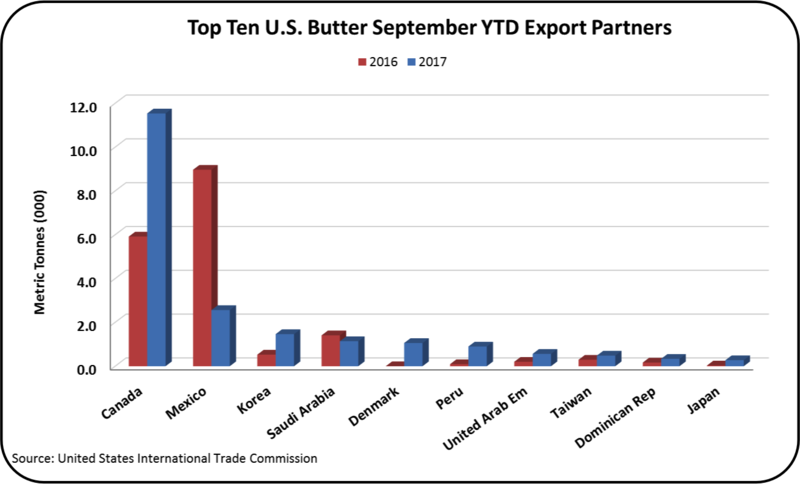 Exports of butter have been near zero for many months. In the next post both exports and imports of butter will be analyzed. Butter production (Chart VII) trends are still following traditional levels in spite of higher consumption rates. 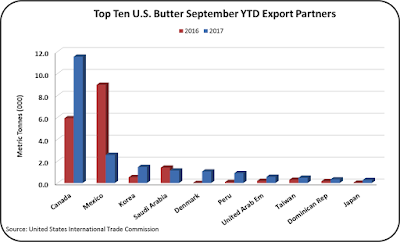 The lack of additional domestic butter churning is an indication that companies have not added additional churning capacity because they are not certain that higher consumption will continue. 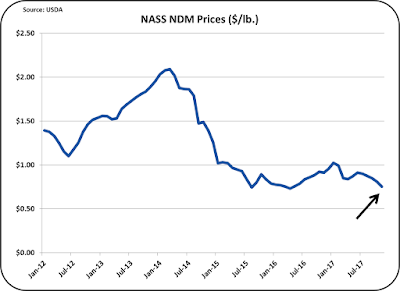 The current low Nonfat Dry Milk /Skimmed Milk Powder (NDM/SMP) prices also play a part in the uncertainty of profits from adding new churning capacity. Skimmed milk for NDM/SMP production is the co-product of butter churning and impacts the overall profitability of butter churning. 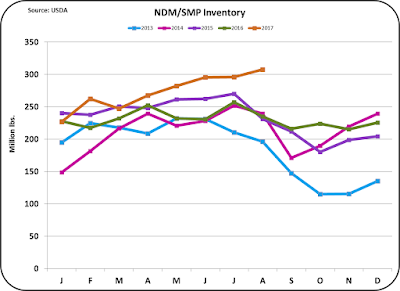 NDM/SMP inventories are reaching extreme levels. NDM/SMP is primarily an export item. The export market is currently very difficult with stiff competition. Prices were down again in October. 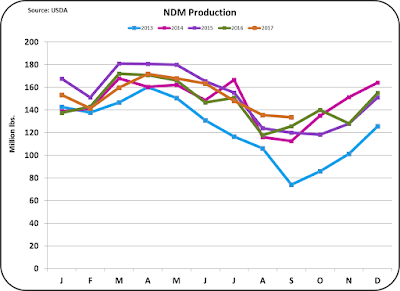 With the strong global demand for butter on the international markets, there is excess NDM/SMP available. The lower price for NDM/SMP raises additional concerns for Class I milk prices if the proposal for changing the skimmed Class I price formula is approved. The Class IV skimmed milk price is set solely by the price of NDM. A lower NDM price will lower the Class IV price and in turn, by the proposed change, would lower the skimmed Class I milk price. Currently the skimmed Class I price is based on the higher of the Class III or Class IV skimmed price. 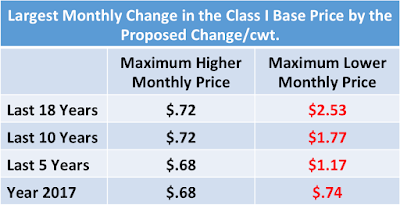 The proposal would use a simple average of the two Classes plus $.74/cwt. to calculate the Class I price. 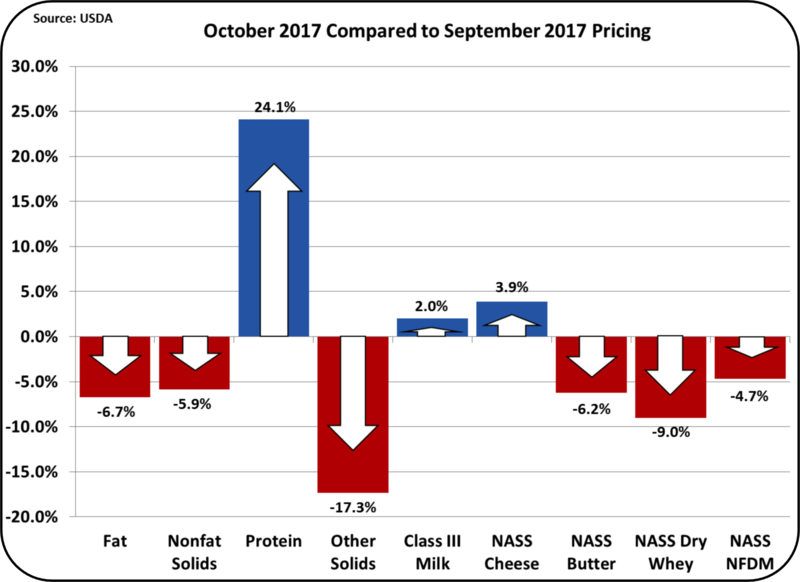 In summary, October milk prices were positive driven by an increase in cheese prices. The future trends will continue to be followed in future posts to this blog. 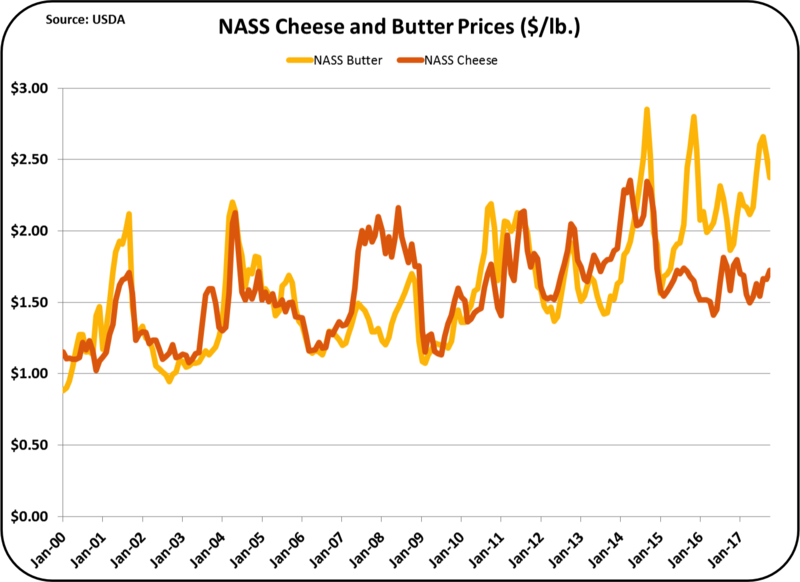 In part one of this two part series, the impact of changes in cheese and butter prices were analyzed economically. The analysis showed that butter, and therefore butterfat price changes have little impact on the Class III milk price. However, cheese price changes have a huge impact on the Class III milk price. Increases in butter prices simply shift payment from milk protein to butterfat with little impact on the Class III price. 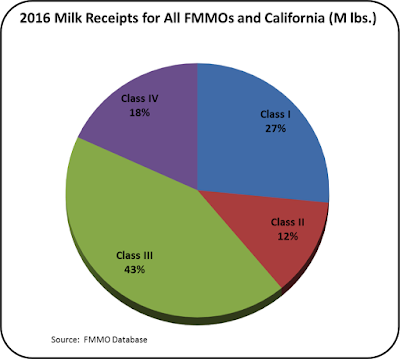 However, there is not much a producer can do to impact Federal Milk Marketing Order (FMMO) milk prices. This post will cover a subject that a producer does have control over and can impact his revenue, profit, and cash flow. There are many variable such as nutrition, genetics, cow comfort, etc. that can influence the productivity of a herd. Due to the complexity of comparing actions and results, some actions that seem appropriate, may actually have a negative impact on profitability and cash flow. One of the often-sited mistakes is cutting all possible costs. In some cases the changes can reduce milk component productivity. Some specific cost cuts may seem appropriate, they may reduce revenue by more than the cost savings. If so, cash flow will be reduced. There is another often seen practice that can hurt cash flow. In many cases, producers and their nutritionists try to constantly adjust nutrition with the ever-changing FMMO prices. When many variables are changed at once, it is difficult to determine which have a positive impact on cash flow and which have a negative impact on cash flow. While this may occasionally work, staying with and fine-tuning specific practices can produce more accurate measurements of any changes. To illustrate this, the analytics below measure the economic impact of changes in milk component levels at different cheese and butter prices. The changes in component levels used in this analysis are based on a recent publication by Dr. Brian Sloan. The data used by Dr. Sloan is based on precisely calculated changes from many past trials involving nutritional changes. It covers many years of trials in various geographical locations and in summary averages results from thousands of cows. His combined results show an average increase of .14% in milk protein and .16% in butterfat with his suggested nutritional changes. The economic analysis shown below compares the change in revenue when milk protein increases from 3% to 3.14% and butterfat increases from 3.5% to 3.66%. The tables below measure the economic impact of achieving higher component levels as cheese and butter prices fluctuate. In Table I it shows the economic results at the component levels discussed in the previous paragraph. Table II shows what the top component increases can produce. In other words, the first table uses precisely the averages from Dr. Sloan's trial compilation and the second table shows what the better herd can achieve. Table I shows that the increase in milk revenue can vary from $.50/cwt. to $1.00/cwt. when components increase from the nutritional changes Dr. Sloan analyzed. The impact is much smaller when cheese prices are low, but doubles when cheese prices are high. 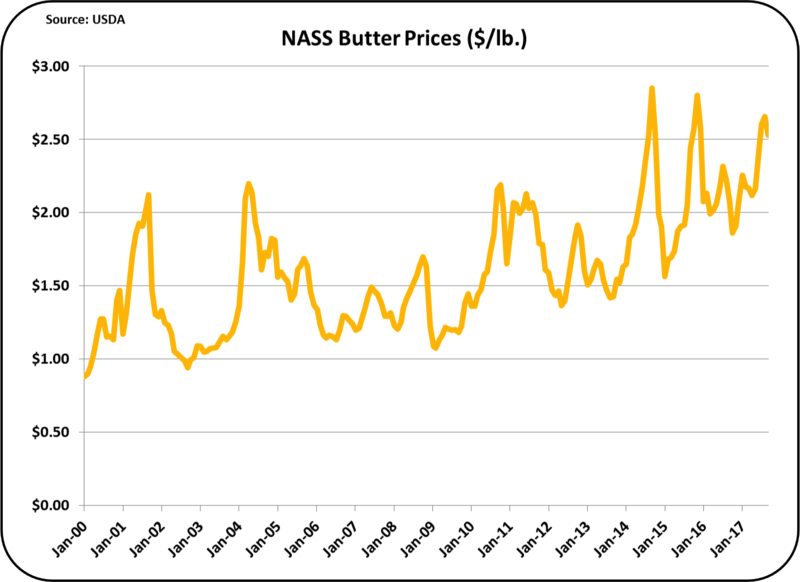 The change in butterfat prices has very little impact on the increase in revenue. This is consistent with the analysis in Part I of this series. Table II shows the potential increase for the best performing herds. It is not a "dream" table but a accurate portrayal of what has happened at the best performing herds. The increases in milk revenue with the nutritional changes studied by Dr. Sloan may increase feed costs. However, in many cases there is no increase in feed cost. Quoting Dr. Sloan, "If care is taken to not over supply some key nutrients and if the power of non linear optimizers in modern software programs are used, it will ensure that revenue will increase sufficiently to provide a positive and continuing increase in cash flow." Chasing the market prices with constantly changing nutritional diets is not a best practice. Some nutritionists have tried minor nutritional changes to increase butterfat only. Although these nutritional changes may a cost little less, the results are significantly less as well. As shown in Table III, the only time this might be slightly advantageous is at the extreme when butter is at $3.00/lb. and cheese is at $1.20/ lb. This has never happened. Milk component increases are the heart of the future for dairy. The growth categories in dairy are all dependent on components. Therefore, chasing components is key to success in the dairy business. This is not a seasonal concept or a concept that will change with FMMO prices. The amount of improved cash flow may change, but increasing components will always be economically advantageous. This subject will be covered in two parts. The first will deal with FMMO pricing and market movements. The second will deal with how a producer can improve his income. Because both subjects are linked, and are also a little complicated, they will be separated in two consecutive posts. The first part, which will be covered below will explain why high butter prices are not much of a benefit to producers. The second part, to be posted next week will show how a producer can improve his income and profit with changes he can control. There is a lot of publicity in the dairy news as to how the current high butterfat prices are making a big contribution to the milk check. In fact, while high butter prices can help a little, the key word is little. The FMMO price formulas vary in their complexity. 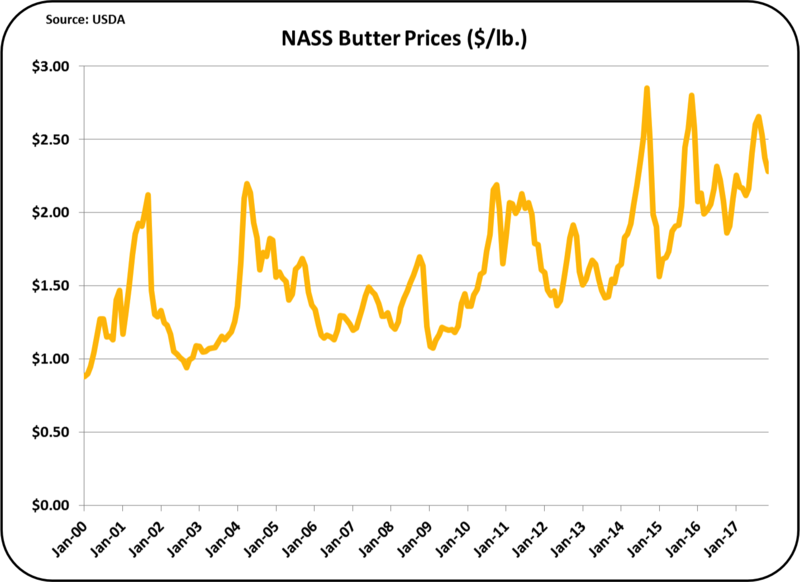 A simple formula like the conversion of butter prices to butterfat prices is pretty simple. 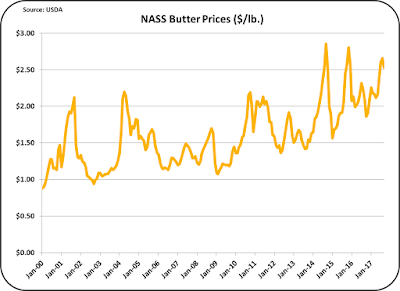 The National Agricultural Statistics Service (NASS) does a through sampling of butter prices and averages them for the entire United States. By the formula below, the butter price is converted into the butterfat price. The "make allowance" ($.1715/lb. in the formula) is an estimate of the cost to churn butter from butterfat. The cost of butter less the make allowance is then adjusted by 1.211 to recognize that there is more than butterfat in butter. The primary added ingredient is water. The most complex formula is for milk protein. The first part of the formula below, ((Cheese price - $.2003) x 1.383), mirrors the formula converting the butter price into the butterfat price. However, the rest of the formula is a little more difficult to understand. It is easiest to explain this part of the formula, ((((Cheese Price − 0.2003) x 1.572) − Butterfat Price x 0.9) x 1.17), when cheese prices are higher than butter prices. The second part of the formula gives credit to price of milk protein when the butterfat is more valuable when it is in cheese, not butter. In other words, if butterfat is worth $1/lb. when used for butter, but when that butter becomes a part of cheese, it is worth $1.50/lb. That incremental $.50/lb. is given to the value of milk protein for its impact on making the butterfat more valuable. The rationale is that cheese cannot be made without milk protein. which is coagulated to capture the butterfat and not let it pass through the cheese cloth. However, when butterfat is worth more in butter than it is in cheese, that "adjustment" becomes a big negative. Currently, butterfat is worth more in the form of butter than it is in the form of cheese. As a result, as the butter price goes up, butterfat goes up in value and milk protein goes down in value. As an extreme example, if the cheese price was $1.20/lb. and the butter price was $2.80/lb., the value of milk protein would become negative. There is more information on the impact of the FMMO formulas in this prior blog post. As another example, the table below shows the Class III price change when the butter price doubles and when the cheese price doubles. When the butter price doubles from $1.50/lb. to $3.00/lb., it changes the Class III price by only $.62/cwt. However, when the cheese price doubles from $1.20/lb. to $2.40/lb., the Class III price increases by $11.60/cwt. 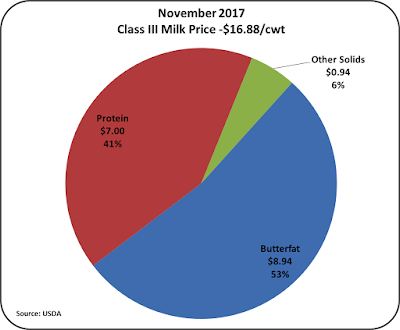 When the price of butter escalates as it has done recently, it primarily increases the value of butterfat and lowers the value of milk protein, but has very little impact on the Class III price. 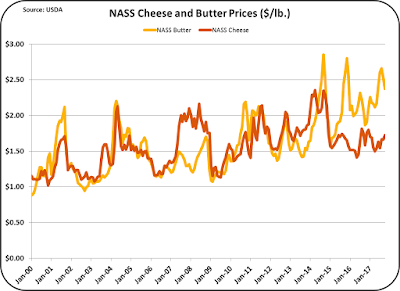 The two charts below show the price of butter and cheese over the last 17 years. 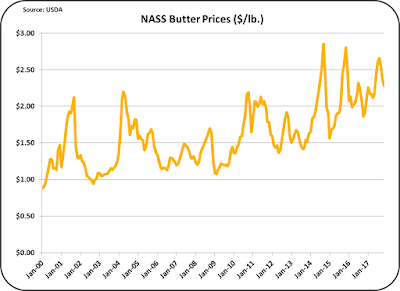 The run-up in the butter price over the last five years has increased the butter price by a little less than $1.00/lb. 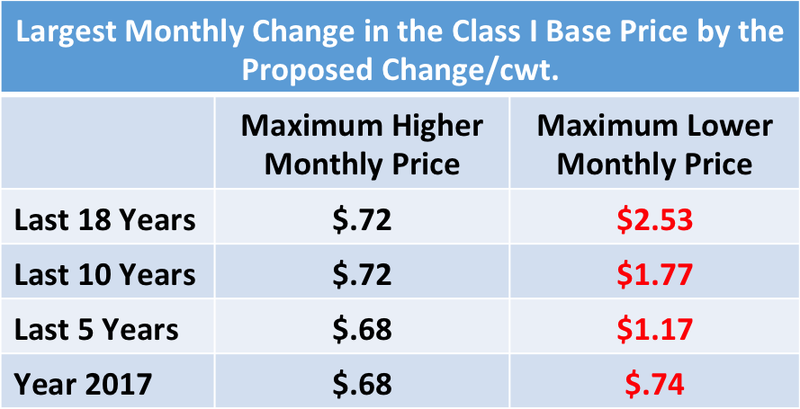 The impact on the Class III price is a little less than the $.50/cwt. Some recent articles have claimed much more, but that is not the case. 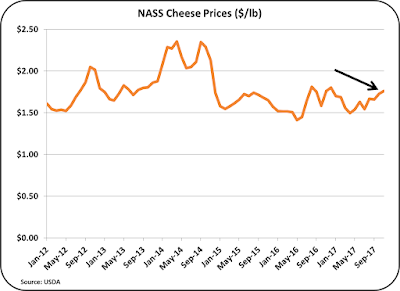 Cheese prices have fallen since 2014 from highs near $2.40 to the current prices around $1.60/lb. What moves the Class III price is the price of cheese. 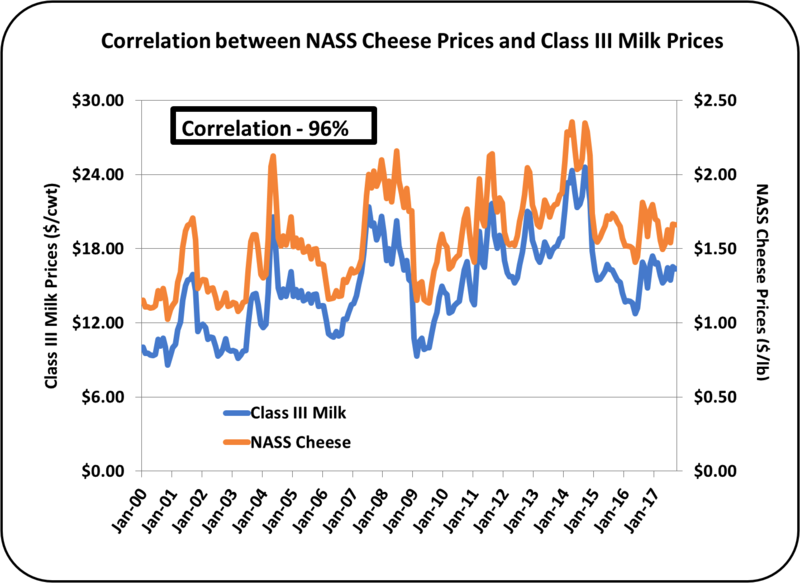 Chart III below shows the tight correlation between the price of Class III milk and the NASS price of cheese. Currently cheese inventories are high and the price is low. The only way to quickly deplete the excess inventory is to drastically increase cheese exports. The price of milk protein and butterfat are not in any way controllable by a producer. 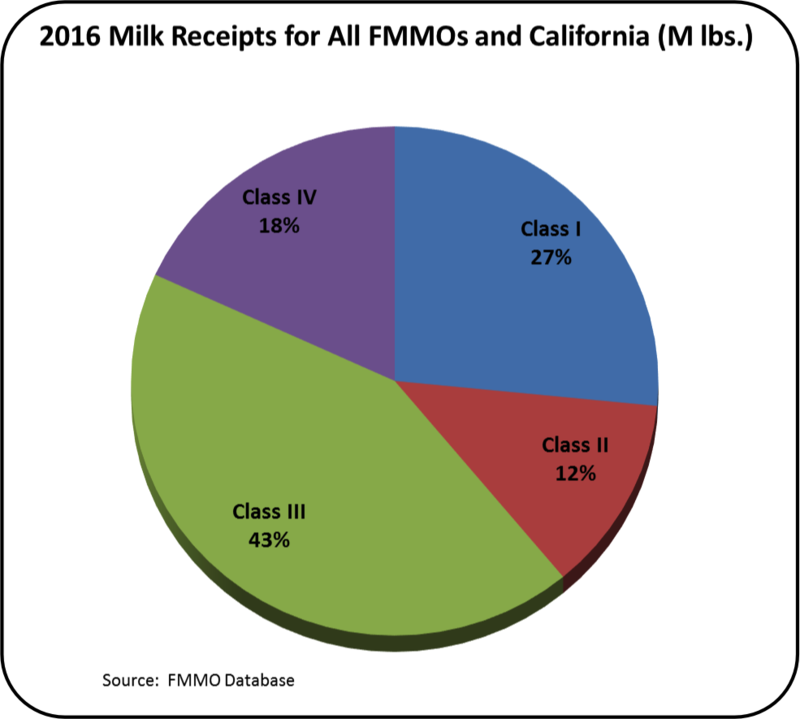 A producer has little ability to change domestic inventories or the many other factors that influence the FMMO value of producer milk. The above information is provided for background for the next post that shows how a producer can have more control over improving his revenue and profit. Don't miss the next post. Reminders can be sent by email by filling in the "subscribe via email" in the upper right hand corner of this blog. Copyright © 2013 Adisseo. All rights reserved.